A well-stocked diaper bag can save your life not only your day. But what do you really need in there? It depends on how old your child is, how long you'll be out, where you're going, and how prepared you like to be. I pack the same stuff in our bag no matter where or how long I will be because YOU NEVER KNOW! Plus I am someone who likes to be prepared maybe a little OCD! 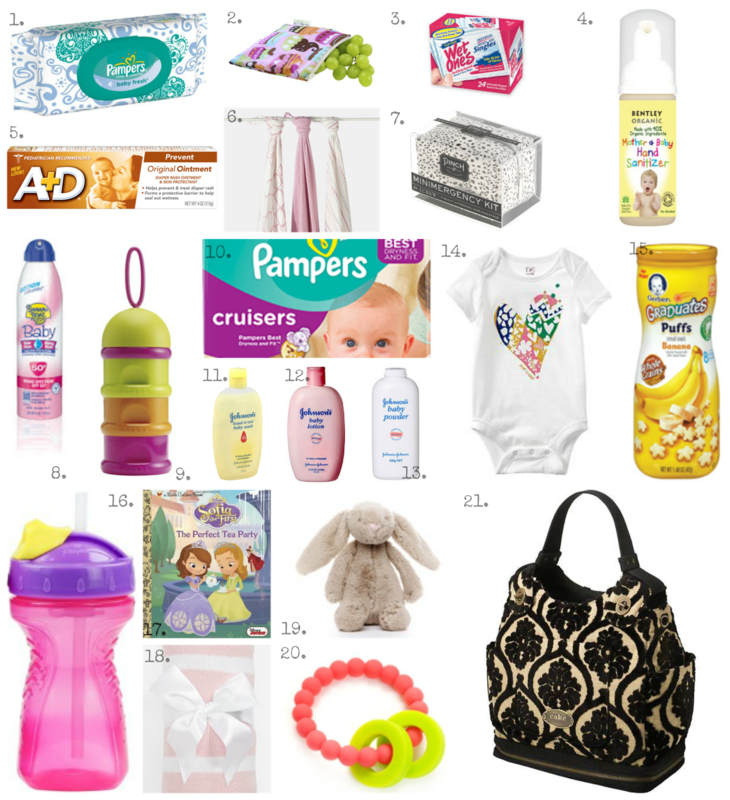 So here's a list of things we bring in our diaper bag for a trip to Grandma's or even out shopping! Now don't think we take all of this to the Maverick for a thirstbuster but if I know I will be out and about running errands or gone longer than a half hour or so this baby (both of them) comes with! Even my stuff fits in our diaper bag! I cannot say enough amazing things about this bag! I love love love it! It's beautiful! My Hubby bought it for me because I wanted it so bad! I get compliments all the time. It holds all of the above plus my stuff! It's been soaked from the lake and still looks brand new! (that's another story). Literally obsessed! Have a great weekend guys and can't wait to share ours with you next week!